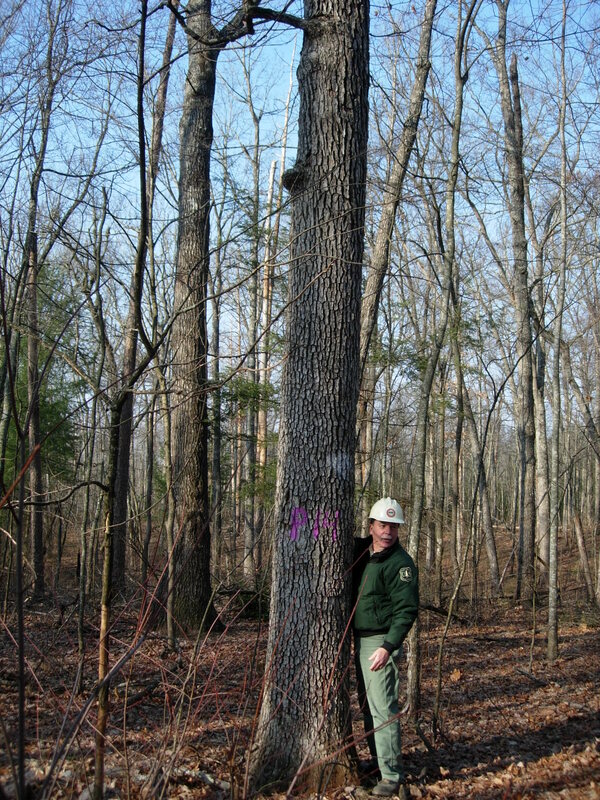 Forest Service timber management officer Daniel Crockett stands near an oak tree in one of the treated stands. The tree was estimated to be more than 200 years old. Photo by Stacy Clark, USFS. The historical extent of oak woodlands in southeastern forests is relatively unknown, and only recently have managers attempted to create or restore oak woodlands in the eastern U.S. However, other countries, especially in the Mediterranean region, have already conducted woodland restoration projects. Clark and her Forest Service colleague Callie Schweitzer reconstructed past patterns of stand growth to understand how the forest had developed before a woodland treatment was implemented. The scientists also investigated the woodland restoration treatment’s effects on forest health by analyzing tree-ring growth. They recently published their findings in the journal Forest Ecology and Management. The study was part of a larger silvicultural study examining how forest management can be used to improve forest health. The larger study spanned 3,000 acres of oak-dominated forest in the Daniel Boone National Forest in Kentucky, and was implemented under the auspices of the Healthy Forest Restoration Act of 2003. The first step of the restoration treatment was identifying trees that should be kept as part of the woodland habitat. Managers on the Daniel Boone National Forest meticulously selected trees with healthy crowns that were in a dominant canopy position, and these trees were not harvested. After the harvest, remaining trees were widely spaced, and the stands will also be burned every 3 to 5 years to maintain an open grassy understory. Clark and Schweitzer used tree-ring analysis to compare age and growth from trees that had been harvested to trees that remained. “Tree-ring growth rates can be used to infer overall forest health conditions,” says Clark. “They show tree response after stressful events, such as drought, and show how trees respond to forest openings caused by disturbance.” The results indicate that a very intense disturbance regime – such as impacts from intensive industrial logging around the turn of the 20th century – created the oak-dominated stands in the study area. 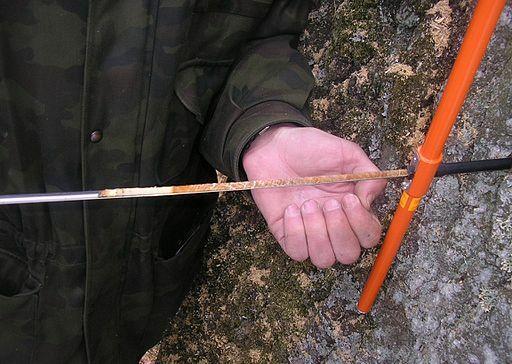 Tree ring analysis involves examining a small tree core that is extracted from the trunk. Each core is a record of how the tree has responded to its environment. Photo by Beentree, courtesy of Wikimedia Commons. The scientists also found that the woodland restoration treatments improved forest health and resilience by retaining trees that grew faster, starting in the 1930s and continuing through the 2000s. The residual trees also had better tree-ring growth during droughts in the 1980s and 1990s. “The stands in our study area benefited from management aimed at improving their ability to respond to drought or pests,” says Clark. The study validates and expands the use of traditional forest management practices that are based on removing trees with poor crown position and condition in order to improve timber values. “This study helps show that we can simultaneously manage for good quality timber, improve forest health conditions, and create desired habitat” says Clark.